Newport exterior wall light. Buy lamps online. Newport it is an original Wall light for outdoor use,. Made in metal structure with opal glass. A wall light with a very attractive timeless shape and aesthetics, with certain memories of traditional nautical lamps. Perfect for terraces and gardens. Three colours: white, green and bordeaux. Water resistant (IP44). Dimensions: Width 280 mm. High: 346 mm. Depth: 320 mm. -Light bulb: 1 x E27 15W (not included). Estudi Ribaudí works with ideas, makes them grow and transforms them into objects. 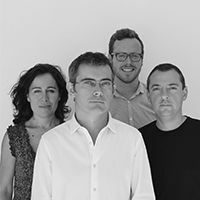 A team of designers and interior designers who work mixing creativity, material and technology to transform it into spaces and objects with identity.